Supply and demand issues continue to make housing less affordable for home buyers in the Greater Toronto Area (GTA), and the Building Industry and Land Development Association (BILD) and Toronto Real Estate Board (TREB) say municipal and provincial government taxes and fees are exacerbating the problem. 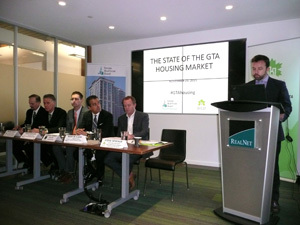 “Government policies at all levels have a major bearing on GTA housing,” BILD chair Steve Deveaux said at a media briefing held at RealNet Canada’s Toronto offices on Wednesday. There were 16,846 low-rise houses available in the GTA in October 2005 and just 4,980 last month, according to RealNet data. Prices, meanwhile, increased from $387,369 to $802,376. High-rise home choices have risen from 13,006 to 21,408 during the same period, while their price increase was more modest, going from $288,587 to $440,382. Prices have been relatively flat over the past four years. There were 124,123 new and resale homes sold in the GTA through the first 10 months of 2015, with a record number of sales reported through TREB’s MLS system. The new housing stock is heavily slanted towards multi-family high-rise buildings at the expense of low-rise detached, semi-detached and townhouses. While the GTA has gone through a condominium-building boom over the past few years, high-rise inventory has dropped from 3.9 months’ worth in October 2005 to 3.1 months’ worth in October 2015. With demand continuing to exert upward pressure on prices, fears of a condo bubble that’s ready to burst should be allayed. “As these units come to bear on the marketplace, there are buyers waiting to buy them and these units are being absorbed quite quickly,” said Jason Mercer, TREB’s director of market analysis and service channels. Carras provided examples of the realities facing the real estate market over the past 10 years. While a four-bedroom, detached, two-storey, 2,500-square-foot house on a 40-foot lot in Richmond Hill sold for $430,000 in 2005, a similar house now goes for $1.18 million. That $430,000 now gets you a two-storey, 1,600-square-foot, three-bedroom townhouse on a 20-foot lot in Whitby. A similar unit to a one-bedroom, 980-square-foot condo in Toronto’s downtown west that went for $350,000 a decade ago will now set you back $645,000. A 620-square-foot, one-bedroom plus den suite in the same area is what you can purchase for $350,000 today. The average GTA high-rise has shrunk from 908 square feet in October 2005 to 767 square feet, while its price per square foot has risen from $318 to $574. “Builders have to continuously be innovative in finding more efficient designs,” said Carras, who added people will need to become accustomed to living in smaller spaces as urban intensification increases and the GTA is projected to grow by 36,000 households and 100,000 people annually for the next 30 years. BILD president and chief executive officer Bryan Tuckey cited an Ipsos Public Affairs survey of 1,500 GTA residents in August that revealed 70 per cent are concerned about their ability to afford to buy their next home. TREB CEO John DiMichele is against the proposed spread of Toronto’s municipal land transfer tax to other parts of Ontario and cited a recent Altus Group study which showed each home sale through the Ontario MLS system results in an additional $55,000 in spending on housing-related goods and services, financial services and taxes paid to various levels of government. If people can’t afford to buy houses, he said it will adversely affect businesses, jobs and the provincial economy. Canada’s new Liberal government has pledged to bring in a new affordable national housing strategy and TREB chief government and public affairs officer Von Palmer thinks its Ontario and municipal counterparts would be wise to listen to the real estate industry and home buyers.